Naomi Campbell burst out laughing when she saw Kim Kardashian's Vogue cover. The British supermodel hinted she doesn't think that the reality TV star earned the right to appear on the front page of the American fashion bible's April issue. When asked about the controversial cover, the 43-year-old star started laughing and told Australia's The Morning Show yesterday: "I do not want to comment. Because I'm a fashion model and I've been working for 28 years and when you get a Vogue cover it's a build in your career, it's a stepping-stone to achieve that. And you know I'm a fashion model so what more can I say." Naomi has been close friends with Kim's fiancé, Kanye West, for several years and clearly wasn't in the mood to start a feud, as she refused to be drawn on the matter when Kylie Gillies asked: "So you think Kim and Kanye haven't earned the right to be on the cover?" She carefully replied: "Those are your words, I'm being politically correct. That's (Vogue editor) Anna Wintour's choice to put them on the cover of her magazine, who's to question it." 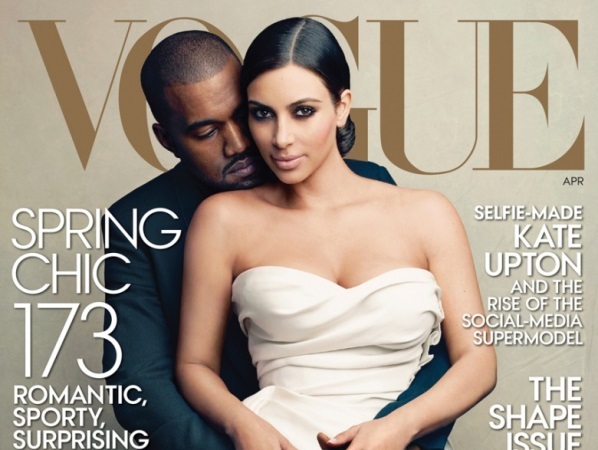 Kim's Vogue cover, which shows her posing in a wedding dress alongside Kanye, caused shockwaves when it was unveiled on the magazine's website on Friday. Former Buffy star Sarah Michelle Gellar announced she was cancelling her subscription as a result. The 36-year-old actress wrote on Twitter: "Well......I guess I'm cancelling my Vogue subscription. Who is with me???" Many of the blonde beauty's followers agreed with her, but Kim's best friend Jonathan Cheban was unimpressed by her comment. He retweeted the message, adding: "Do u matter? (sic)"